The village of La Oliva was formerly the home of the military governors of the island, between the 17th and mid-19th centuries, and some historic buildings from this period can still be visited in the town. The Governor's townhouse (Casa de los Coroneles) has been restored and is open to the public, boasting some intricate woodwork. Also in the centre of the village is the pretty church of Parroquiade Nuestra Seiiora de Candelaria, with a square bell tower and finely carved wooden door. The interior of the church features a painting of the Last Judgement, a Baroque altar painting by Juan de Miranda, and some wonderful trompe l'oeil work. The village also has an art centre exhibiting the work of Canarian artists (Centro de Arte Canario Casa Mane). The somewhat desolate and barren natural landscape of the interior gives way dramatically to the bright turquoise water of the sea, and the beaches around La Oliva are very pretty. The water tends to be calm, making it a good swimming destination. 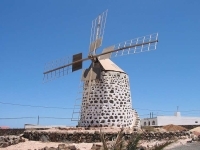 Many tourists find it worth their while to spend some time in La Oliva and a number of fun outdoor activities are available, including sailing and mountain biking jaunts, and excursions into the Parque Natural de Corralejo.